At the core of the LunaHR platform is a simple and intuitive web based interface which provides self-service facilities for employees, supporting flexible, hierarchy and authorisation paths to suit an organisation’s structure. The platform notifications and reminders facilities provide a communication channel for all HR communications as well as corporate and department announcements. The ability to customise permissions and create organisation specific user roles allows the LunaHR platform to be tailored to individual business needs. LunaHR dashboards provide real time information to employees and management and this will soon be enhanced with employee wellbeing trackers and trend analysis. LunaHR is a fully encrypted cloud based solution, we use the latest encryption methods, allowing for employees to upload HR documentation and manage their data safely. Implementing other security measures e.g. strict validation, comprehensive firewall, password regulation, limiting login attempts, etc… the risk of data theft or unauthorised access is at an absolute minimum. LunaHR is GDPR compliant, the platform allows employees and HR to easily store and manage personal data, without concern over data protection and privacy. You can read more about GDPR here. LunaHR has a fully configurable company directory integrated into the core module, selected employee data can be displayed here, enabling employees and management to find information about colleagues. The LunaHR company directory has built in filtering functionality, enabling employees to filter by department, user types, office locations and so on, allowing employees to effectively find colleague data and increase understanding of company structure. LunaHR sends out detailed email notifications, whether it is a new account with login details or an approved leave application, employees have valuable information straight into their inbox. 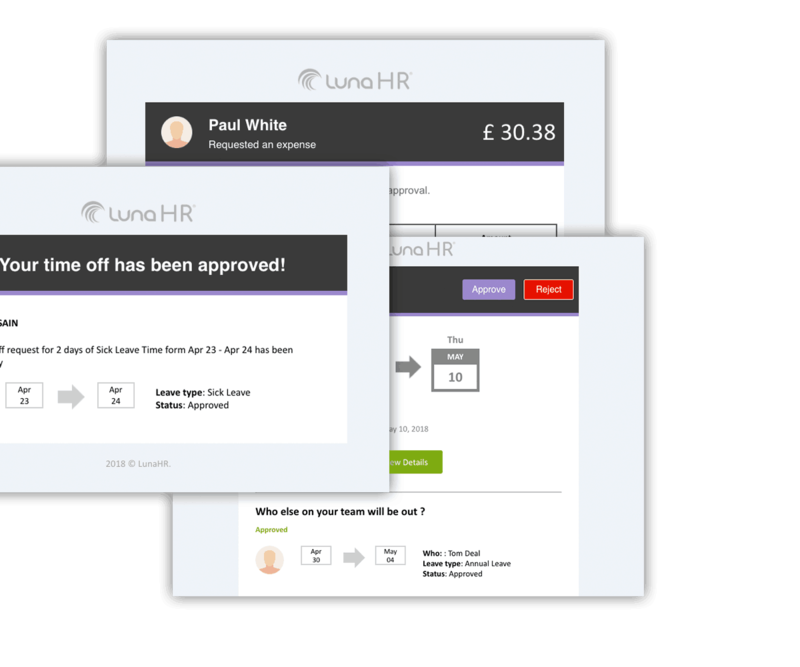 Along with email, LunaHR has a built in notification system that works with desktop notifications, HR information seamlessly shows without employees entering the system, allowing busy employees to focus on their work without fear of missing an HR related update. LunaHR uses a flexible hierarchical system, where HR can create different company levels, office locations, departments and users, making it easy to replicate the hierarchy of your company’s structure. Business rules further enhance this flexibility, specific rules and HR policies can be incorporated into the company structure you have created, giving HR complete control of how HR is handled on every level.